Nintendo DS and Sony PSP loosing relevance and life on Portable Gaming! Digital content distribution has disrupted several notable industries. In that context, no industry has been more impacted by digital distribution than the video games. Leading the disruption are iOS and Android devices, whose free and inexpensive games, distributed across a massive installed base of powerful and networked tablet and mobile phone form factors, have already disrupted billions of dollars of game revenue. 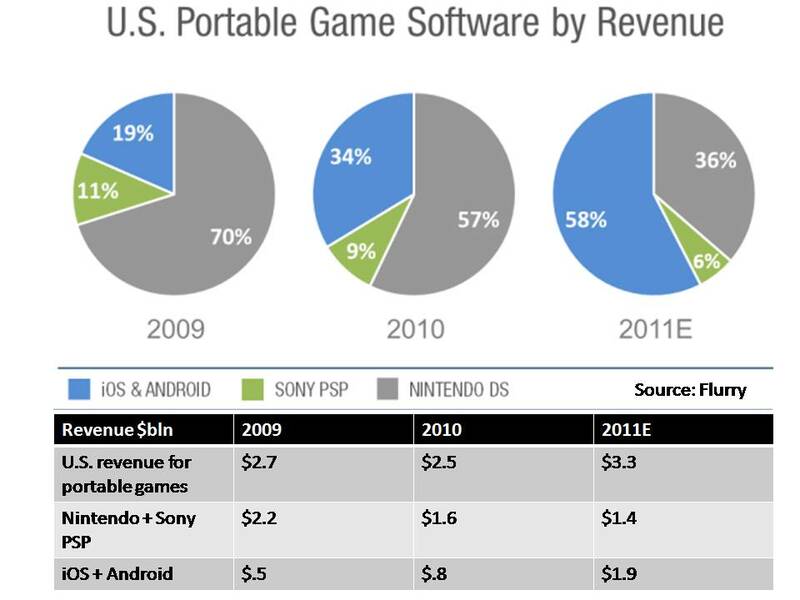 Portable gaming, has been dominated by Nintendo and Sony for over two decades. In this model, at retail, consumers pay around $200 for the gaming device and up to $40 for popular game cartridges. Because of the similar form factor, overlap in consumer base (especially younger players on iPod touch) and the casual nature of game content, iOS and Android devices have redefined the category. With the inclusion of smartphone revenue into the category, shifts taking place in market share become clearer. Within the portable category, an abundance of digitally distributed free and $0.99 games, available on hardware that is both comparably priced and more powerful than traditional portable game devices, better appeals to many consumers. As a result, the days of paying $25, or more, for a cartridge at a retail store may soon end. Further, the installed base of iOS and Android devices has not only reached critical mass, but also continues to grow at unprecedented rates. In their latest public statements regarding installed base, Apple and Google reported a total of 250 million iOS devices and 190 million Android devices activated, respectively. Due in part to its demise in the portable game category, Nintendo is facing its first fiscal year loss since the company began reporting profits in 1981. Combined with slumping Wii sales, Nintendo is indeed struggling. Equally concerning for Nintendo is that the battle for video game dominance is entering the living room, with entries by both Apple and Google into the TV category. Ostensibly, this new class of hardware will create a new platform upon which the digital distribution model of apps will be overlaid. Now, in addition to tablet form-factor competition, the console game industry, which currently pits Microsoft, Sony and Nintendo against each other, will additionally face competition from Apple and Google TV initiatives. Beyond 2011, if Nintendo continues to face financial hardship, it may be forced to consider difficult choices such as divesting its hardware business and distributing its content, for the first time, across non-proprietary platforms. In February this year, Nokia’s CEO Stephen Elop mentioned about the burning platform in a internal memo to Nokia employees. Nintendo has a very similar problem at hand. A burning platform and hard decisions for its future – Innovate or Die! One of my oft reservations about G+ and after its initial success has been the lack of games. 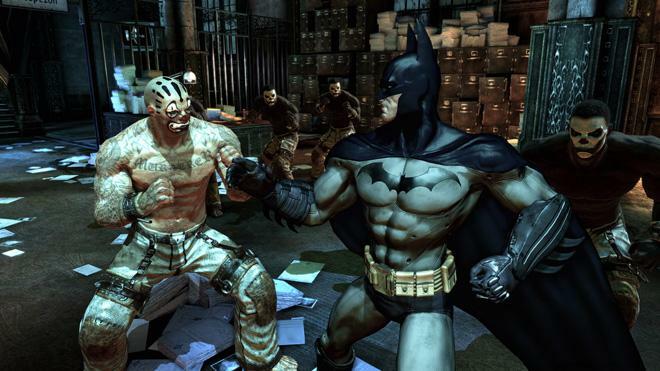 Games have been have been huge sticking pads for Social networking sites such as Facebook. It increases the user time spent on the site and gives that much bigger a window for more ads to be served to the consumers. 1.Google is attempting to break today’s 30 percent cut that has become standard across both Facebook and Apple. Google will share 95 percent of the revenue from virtual goods sold with the developers and keep only five percent for itself. 2.Google is also interested in allowing games to be played cross-platform, meaning a person could pause their game on the Web and then pick back up in the same place on their phone. If Google+ games could run through the browser on the iPhone or iPad, it could undercut Apple on its own device.In that scenario, consumers would have to find a compelling reason to switch from playing games that are downloaded through the App Store to playing games through a Google+ experience. 3. Google’s partnership with Adobe will be a critical experience factor for users on Google versus Apple. Add to that a HTML5 integration in the horizon, Apple also has a reason to be wary of Google’s moves in online gaming. Regardless, it should be comforting to developers who are uneasy with the control that either Apple or Facebook has from time to time. Developers will be looking to see if the Google+ game network can be as powerful as Facebook. One thing for certain is that they all can start off with a fresh slate. Not one is massively bigger than the others, like Zynga, which is larger than the next 15 developers combined. The full list of games now on Google+ includes Angry Birds, Bejeweled Blitz, Bubble Island, City of Wonder, Collapse! Blast, Crime City, Diamond Dash, Dragon Age Legends, Dragons of Atlantis, Edgeworld, Flood-It!, Monster World, Sudoku, Wild Ones, Zombie Lane and Zynga Poker. Freemium Gaming Business Models: Here for Good! Gaming takes the cake in terms of Apps and its stickiness with users.Average mobile gamer plays approx 7.8 hours per month where-as an iPhone user plays the most at 14.7 hours per month & Android users play 9.3 hours p.m. This data was released by Nielsen for Q2,2011. 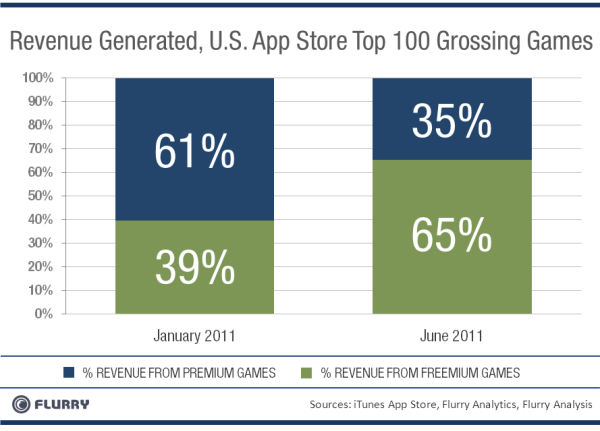 An interesting survey of top 100 grossing games on the Apple Apps store in January and June of 2011 by Flurry yields an interesting trend in terms of gaming. Games occupy more than 75% of all top 100 grossing apps in the app store, it’s the single most dominating business model in the mobile apps industry today. The interesting result of this survey is the growth of revenue from Freemium games at the cost of share decline of Premium-paid up games. Stickiness is the key to success of all gaming because this then provides compelling spending opportunities and branding spaces for consumers as well as sponsors. 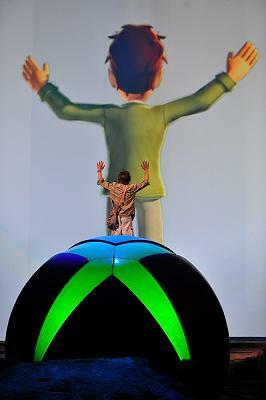 The best example is that of Zynga which with its Farmville and Cityville franchises has worked its way to a $1bn IPO. A freemium model with in-app purchases, is perceived to be advantageous as it can induce higher trial and usage rates. Also, when a network of friends opts in to play together, their group profiles and consumption can be an interesting hunting ground for brand ads and sponsors. Those who consider buying or paying money on the gaming app will anyways be doing it if the game appeals to them. Thus in terms of appealing to larger initial masses, a freemium app definitely beats out a premium app. The other problem with a premium app is that without any trials on the game, it is a difficult choice to invest on the game upfront to the users. Freemium and Free-to-play is here for good. The Gigahertz Microprocessors and the iPads of the world along with Cloud computing could be unveiling the age of “cloud gaming”. Several companies hope using cloud computing to store games will be the real shift by letting gamers play high-end titles anywhere, on almost any machine. 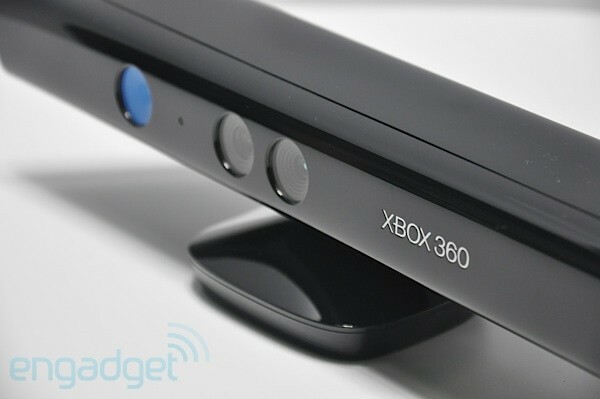 A view to “cloud gaming” is that If fully realized, they say, cloud gaming could be a console killer. The need and the idea is to make video game content increasingly free from the restrictions of device and location, while showcasing the ability to instantly play the latest, most advanced games at the touch of a button. Cloud gaming uses rapid data compression to let users store their games “in the cloud” — on Web servers — and then pull them down and play them using a regular Web browser. It’s the same concept as storing photos on a site such as Flickr or music videos on a MySpace page. The user doesn’t actually have those files on any one particular computer but can access them from anywhere. The only thing the user needs is a capable device, a decent browser and an a fast internet connection. The iPAD seems to be a good answer in terms of a capable device. 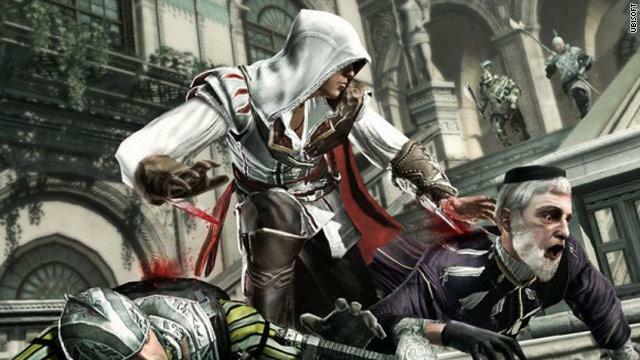 There are a few companies which are making early inroads into the area of “cloud gaming” and some interesting game titles such as Assassins Creed II, “Batman Arkhalam Asylum” and “Mass Effect II” have found new homes in the crowd and more are to follow. Revenues are to be made from subscription services, or pay per play or even in terms of trail gaming before buying the real monty from a store. 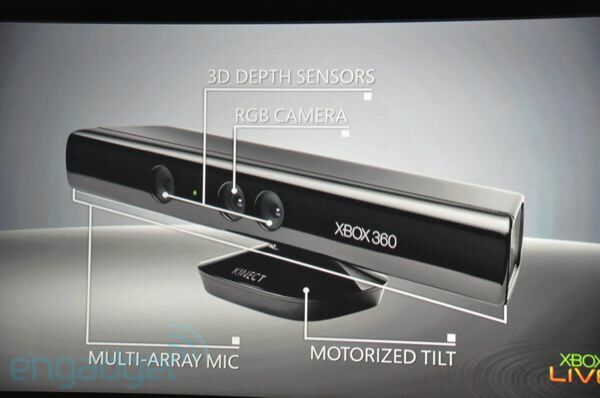 Microsoft with its Xbox Live network, Sony with its Play Stationplus, Virgin, aggregators like Onlive and Gaikal are early entrants into this new gaming construct. However, not everyone in the tech community is sold just yet on the concept of “cloud gaming”. Some question whether gamers, who presumably already have at least one gaming console, will pony up again for the ability to play their favorite titles from the cloud.Even if it costs less to rent or play a game — and it probably will … Game streaming will have a tough time competing with actual hardware for all but the most dedicated gamers. Interesting piece and we would be keeping an eye on that. Mobile gaming is Big… If the reports from the Apps store reports have to be believed. 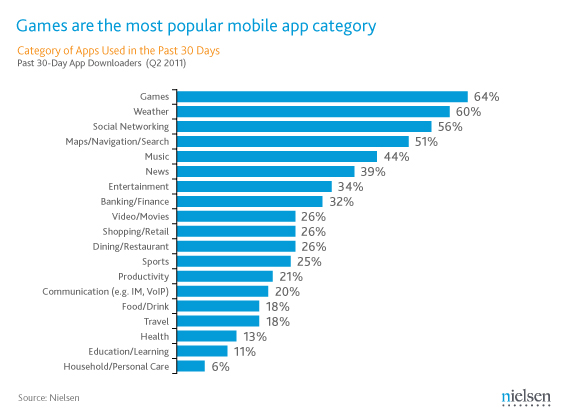 Gaming is one of the top 3 most downloaded applications from Apps stores: Be it Apple, Google, Ovi or the many others. Gartner estimates 70 percent to 80 percent of all mobile consumer applications downloaded are mobile games. The mobile gaming industry grew by 19% YOY 2009-10 versus 2008-09 and Gartner redicts the growth to remain intact at 15% CAGR for the next half a decade. 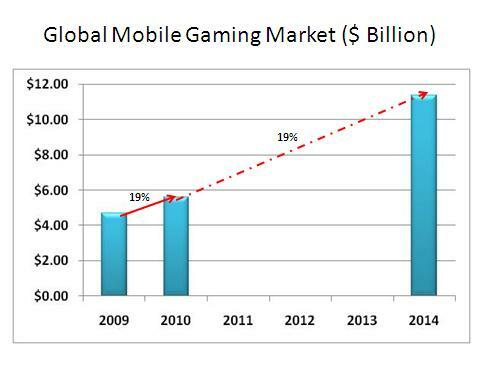 The mobile gaming market is expected to reach $11.4 dollars by end of 2014. While a majority of Apps downloads are games, 60 to 70% of downloads are “free”. This trend doesnot look like its going to change at least in the next 2-3 years. 1.The increasing accessibility of mobile games in emerging markets, where alternative gaming media are limited. 4.Improved user interfaces are a top priority for handset vendors as a competitive differentiator. A growing number of devices are implementing touchscreens and gesture, and enhanced qwerty keyboards will also improve the end-user experience. 5.An increasing number of games are taking advantage of existing device features, such as camera, GPS and accelerometers, to enhance game play. 6.Direct billing is one of the most significant value-adds that Content Service Providers can provide their partners – allowing consumers to charge purchases directly to their wireless bills. 7. Improvements to boost access to mobile games via search and recommendation engines are also improving take rates for mobile gaming, while more-competitive data pricing will lower barriers to adoption.